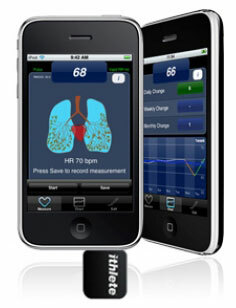 When I first learned about iThlete, I was extremely excited to get one. I knew several NFL teams were using an HRV (Heart Rate Variability) system called Omegawave, but Omegawave was way out of my price range, costing thousands of dollars. iThlete, built on some of the same science, was less than $100 with app, dongle, and chest strap (cheaper if you have the strap already). Now that’s more like it! So, what is HRV and why is it important? Well, HRV is a way to test your current fatigue, but more specifically your CNS (Central Nervous System) fatigue. An HRV test measures the time between your heart’s beats. When rested, the time between heart beats will vary efficiently based on your breathing. Your CNS regulates beats so that your heart beats more rapidly when inhaling (new supply of O2) and less rapidly when exhaling. However, when your CNS is fatigued (like after a hard workout), your “heart beat efficiency” drops and times between beats are more regular (a little counter intuitive at first — I originally equated consistent beats with recovered — but your body is smarter than that). The CNS and PNS (peripheral nervous system) controls everything about how we move. Every stride is a complex loop of sensory input and coordinated motor unit firing. Thus, understanding how your CNS is taxed and how long and well it responds to being stressed (via workouts) can greatly greatly benefit the athlete and coach. A low HRV score means your CNS is suffering and working sub-optimally. And thus your chance of injury is higher, especially if your workout calls for a taxing CNS regiment (e.g. maximal velocity sprints, heavy deadlifting…). A high HRV score means you are primed for a good workout from a CNS perspective. Think about it this way: A low HRV score means you are going to be less coordinated. I don’t mean coordinated like rub you tummy while patting your head. I mean motor units firing in synchronized and successive order to make accurate and powerful movements. Freelap — this changes everything. I love everything about the Freelap timing system, except what it’s telling me. And it’s screaming that I’m “OLD AND SLOW”!! !